Offering a choice of one, two and three bedroom holiday apartments each of them fully self-contained with full size, well appointed kitchens, laundry facilities, Free WIFi, free in-house movies. 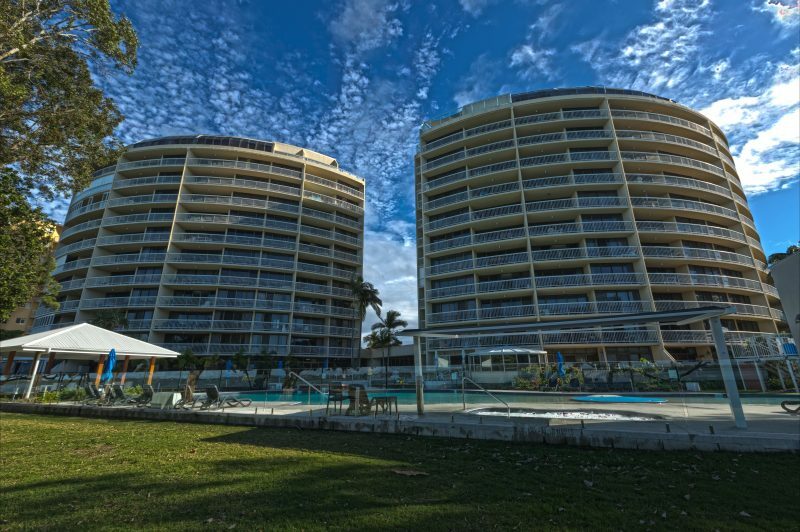 Every apartment features a large dining area and lounge which lead out onto a north-east facing balcony or patio, designed to make the most of the sunshine and the spectacular views over the Pumicestone passage to the Pacific Ocean, Bribie Island and Caloundra. 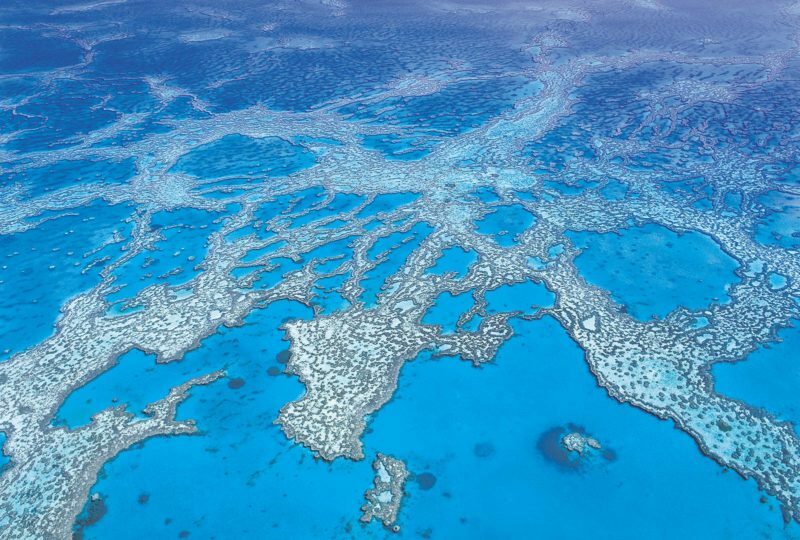 Their resort facilities consist of a large lagoon style heated pool adjoined to a heated children’s pool and waterslide. There is an outdoor heated spa, sauna, a full size floodlit tennis court and a barbecue in their tropical gardens. The Golden Beach shopping precinct is within easy walking distance providing a variety of retail outlets. 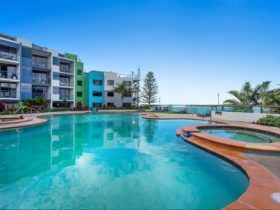 Caloundra’s main shopping centre is a pleasant 15 to 20 minute walk or two minute drive offering the services of all the main retail outlets. 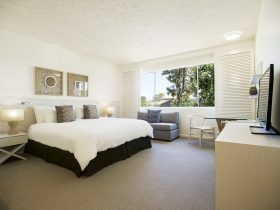 Relax in luxury in their new Deluxe Family Apartment. Located on the fifth floor it offers stunning ocean views and can sleep 6 people. There is a large kitchen with fridge, freezer, oven, microwave, stove top as well as a washing machine and dryer in the laundry room. Contains one queen, one double and two single beds. Full size fully fitted kitchen and laundry. 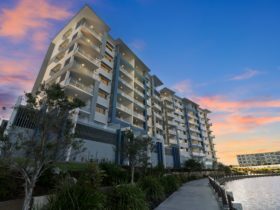 Spacious lounge and dining area leading onto north-east facing balcony or garden terrace with stunning views over the Pumicestone Passage to Caloundra and Bribie Island. 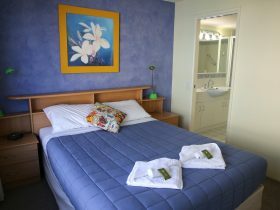 One bedroom with queen size bed and en-suite. Holiday rental from three nights. Fully self contained two bedroom apartments with en-suite plus additional bathroom and separate toilet. Full size, fully fitted kitchen and laundry. 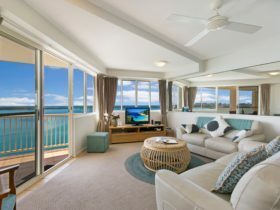 Spacious lounge and dining area leading out onto a north-east facing balcony or garden terrace, most with stunning views over the Pumicestone Passage to Caloundra and Bribie Island or over their tropical gardens. Two Bedroom Garden and Ocean View apartments available. Spacious apartments with fully fitted, full size kitchen and laundry. Master bedroom with queen bed and en-suite, second bedroom with two single beds and third bedroom with two singles, a triple bunk or two double bunks to sleep two to four children and second bathroom. 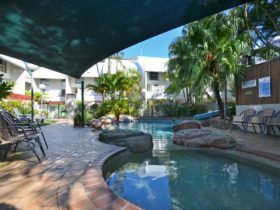 Large lounge and dining area leading onto a north-east facing balcony or garden terrace with views over the Pumicestone Passage and up to Caloundra. These price are subject to change, please call directly to confirm a rate.